Dedicated to the merry little hound who loves to sniff, snack and snooze! 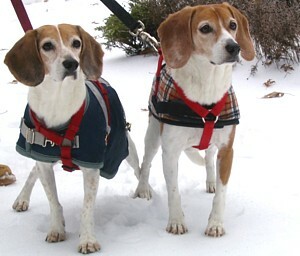 Two things we have used for our Beagles to get through the cold weather months are coats and boots. While Beagles may have double coats, they lack the thick fur of a Golden Retriever or Collie, so a Beagle who spends most of the time indoors may tend to get cold (shivering is a giveaway!). We use a harness when leash walking, so we either use a coat that has a slot in it to allow a leash clip to slip through to attach to the harness clip or we loosen the harness and put it over the coat. Beyond that, there are many different fabrics and styles, depending on the magnitude of the deep-freeze in your area, and how fashion forward your pooch needs to be. Another important key to good winter canine health is to keep your dog's feet warm and protected. During the winter, snow, ice, and ice melting products can irritate the pads on your dog's paws. You can buy boots that either attach with velcro, or boots that are made of rubber, balloon-like material that are easy to slip on and off. These boots are good in any weather to protect your dog's paws, especially if you have an older dog, as we do, who drags a rear foot and damages his toenails. There are also wax-like materials that you can apply directly on your dog's pads to protect them from the salt thrown down on sidewalks. Always be sure to clean your dogs pads thoroughly when you bring them in from a walk to ensure no salt or ice is trapped between their feet or in the fur on the bottom of the paws. 1. Just as arthritis can be more problematic for us when the temperature drops, so too does this apply to our animals. If your best buddy appears stiff first thing in the morning or is more tentative when navigating stairs or jumping up and down off the furniture, I encourage you to contact your veterinarian. These days, there are so many beneficial treatment options for soothing arthritis discomfort. For your pet�s sake, make the effort to learn more about them. 2. When the temperature drops, outdoor kitties like to snuggle up against car engines for extra warmth. Be sure to provide plenty of notice before you start up your engine lest a �kitty squatter� sustain serious injury as a result of moving auto parts. Vocalize and tap the hood a few times. Better yet, lift the hood to alert any slumbering guests of your intentions. 3. Antifreeze is terribly toxic for dogs and cats. Even a few licks of the stuff can cause kidney failure and severe neurological symptoms, usually resulting in death. Unfortunately, most antifreeze products have a sweet flavor making them appealing to dogs. Cats are too discriminating to voluntarily taste the stuff, but should they step in antifreeze, they will ingest enough to be toxic during their grooming process. Please prevent your pets from having any access to antifreeze by checking under your vehicles for leaks and storing antifreeze containers in a safe place. 4. Wintertime is definitely dress-up time for dogs, when the clothing is functional rather than just adorable. Just like us, many dogs are more comfortable outside when wearing an extra layer. Smaller dogs in particular have difficulty maintaining a normal body temperature when exposed to freezing conditions. If the love of your canine life happens to be an arctic breed (Malamute, Husky, Samoyed), no need for canine clothing! 5. Regardless of season, all animals need access to water round-the-clock. If your pet is reliant on an outdoor water bowl, strategize a way to prevent the water from freezing. Water bowl heaters work well. Additionally moving water is more resistant to freezing- consider creating a little �drinking fountain� for your pets. 6. Sure the weather is cold, but your dogs still need plenty of exercise for their physical as well as their psychological well being. Besides, there�s nothing quite like the feeling of relaxing by the fire with a content and tired dog at your side! If the weather is truly too inclement for both of you to be outdoors, look for an indoor dog park or consider doggie day care, assuming your dog enjoys such venues. 7. I�m all for hiking with dogs off leash, but in winter, be extra cautious around ponds and lakes for fear of thin ice. Not only is falling through the ice life threatening for dogs, it creates a situation that often becomes life threatening for the humans involved in the rescue operation. 8. Salt on sidewalks and roads and even ice that adheres to all of that fuzzy hair between your dogs toes can create irritation and sores. Inspect and rinse your dog�s tootsies as needed. 9. I strongly encourage having dogs and cats live indoors. If your living situation absolutely prevents this, and there are no other viable alternatives, please provide your pet with an enclosed shelter that is warmed by a heating device and contains plenty of clean, dry bedding. Also, remember that your pet needs just as much attention from you in frigid temperatures as during the warmer seasons. 10. �Tis the time of year when we humans tend to overindulge, eating all kinds of things we shouldn�t. Don�t allow your pets to become a victim of this holiday spirit. In addition to adding unwanted and unhealthy pounds, eating rich and fatty foods predisposes them to gastrointestinal upset and pancreatitis either of which could land your four-legged family member in the hospital for several days (not to mention create some significant rug-cleaning expenses for you). 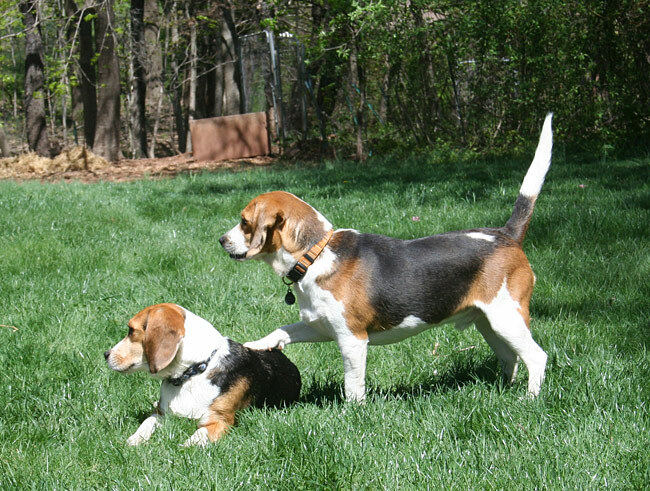 Don't forget to visit us on our Facebook Beagles on the Web page! No Time for your Beagle?